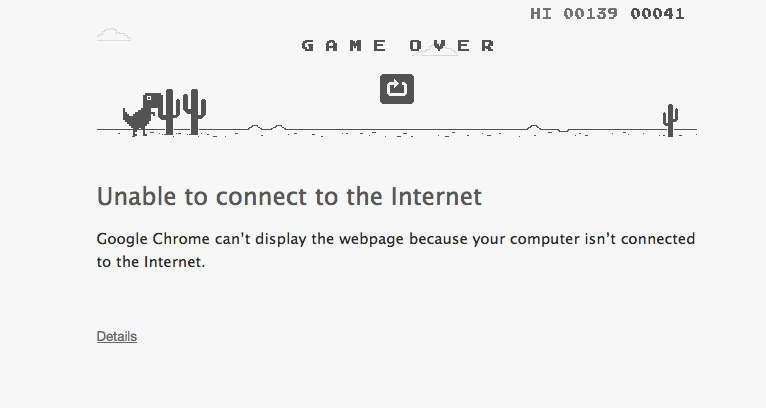 During my perpetual quest for the perfect Phun Phriday post (something that is fun and has zero educational value – but is appropriate for most audiences), I happened to read a tweet from Joe Hanson (@jtotheizzoe) about his new addiction to playing a game with the Google Chrome Dinosaur that appears whenever you try to access a site and your internet connection isn’t working. Strangely, I have seen a lot of that dinosaur this week. Apparently my router decided to implode. I probably would have diagnosed the issue faster if I wasn’t ridiculously entertained by trying to get T-Rex to jump over cacti. What’s really bad is when your internet connection is actually working and you deliberately disable it to try to beat your embarrassingly low score that was topped by your 12-year-old daughter the first time she played the game. Here are some other Google Easter Eggs if you are interested!